Formally called the Mumbai-Ahmedabad High Speed Rail Project, it will run at an elevation of 18 metres for most of its route — 471 km out of 508 km — primarily to ensure it travels over the existing railway route. 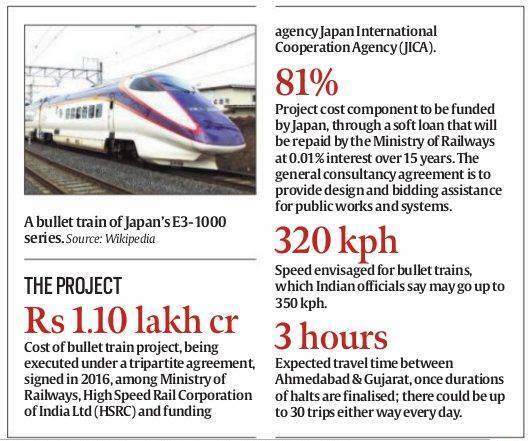 With Prime Minister Narendra Modi and Japanese PM Shinzo Abe set to lay the foundation stone Thursday for the bullet train project, whose deadline has been advanced by a year to 2022, the High Speed Rail Corporation of India (HSRC) is waiting for the final nod to its detailed project report on the route, which will include a 7-km stretch under the Thane creek. Formally called the Mumbai-Ahmedabad High Speed Rail Project, it will run at an elevation of 18 metres for most of its route — 471 km out of 508 km — primarily to ensure it travels over the existing railway route. The remaining 37 km include the 7 km undersea stretch between Thane and Vasai, besides another 15 km underground in Mumbai. HSRC officials still call it a “proposed route map” pending approval from the Ministry of Railways, but believe that is only a formality. The project will require acquisition of over 700 hectares land in Gujarat, and officials are conducting a social impact survey before they begin the process. “The route has been so designed that most of the structures along the way are railway properties, for the corridor runs close to the existing railway line on the railway premises,” an official said. In Ahmedabad, Vadodara and Surat, the respective civic bodies will join the railways in the acquisition process from private owners. Among the properties that may be impacted in Vadodara are parts of residential colonies. In some areas, residential properties close to railway premises too may be acquired. In Surat, too, the HSRC is looking at acquiring part of private properties along the railway station, primarily to create the terminal for the bullet train. Officials say construction will be completed simultaneously on the entire stretch, with contracts being awarded for specific portions of the corridor. “The tenders will be floated soon after the inauguration ceremony by Prime Minister Modi and Japanese Prime Minister Abe Thursday. Work on the terminal at Sabarmati will start almost immediately. We are hopeful that construction on the corridor will begin within the next six to eight months to meet the 2022 deadline,” an official said. Modi and Abe will also inaugurate a dedicated High Speed Rail Training Institute for about 4,000 technical staff of the bullet train project. This will be located on the existing campus for the Vadodara-based National Academy of Indian Railways, formerly called the Railway Staff College.